It all started a couple days after the release of Defiance. I had reached masters in Draft and I was ready to start brewing in Constructed. My friend and teammate Batteriez was working on a Jennev Moment of Creation deck. “Batteriez!” I typed furiously. “Why are you playing Moment of Creation that card is hot garbage! Why not try the Howling Peak + Molot & Nakova threat base instead! Also, why are you playing Howling Peak Smuggler? That card is a 2/2! Why not play the far superior Jennev Merchant, a 3/2 with Aegis, the strongest ability in the game!” Batteriez was intimidated by my powerful and commanding demeanor and reluctantly agreed that Jennev Merchant and Howling Peak were more powerful than measly Howling Peak Smuggler and Moment of Creation. I then decided to play some Jennev Peak on ladder. The deck was powerful! Every time I played the card Howling Peak I was winning! The deck got me all the way to rank 22 on ladder, at which point I decided it was time for bed. I went into the official Eternal Card Game discord and confidently proclaimed, “I have broken the format! All will be revealed when I hit rank 1!” Some people asked for proof and mocked me but I persevered through it all so I could bring you all this beautiful deck. Little did I know that this deck would become far more broken as I continued to perfect it. I found that the powerbase for the deck was extremely wonky. I had to support a TTTFFF card in Heart of the Vault while also trying to play Wisdom of the Elders and Hailstorm on three. Smells like a recipe for disaster. I decided to cut Heart of the Vault and add Jotun Feast-Caller. This allowed me to refine the powerbase, even so far as to allow me to play 4 Cobalt Waystones. Around this time I also realized that Jennev Cargo was worse than Seek Power as I always wanted to get to 6 power for Howling Peak. I piloted this refined version all the way to rank 4, but then I got stuck. What was I going to do? I realized that sometimes I would lose to a random do-nothing fatty. A do-nothing fatty is a card that costs 4 or more that has no immediate impact when it comes into play and thus is prone to die to removal for no value. Examples include: Sandstorm Titan, Worldbearer Behemoth, or Tavrod, Auric Broker. Time, Primal, and Fire just didn’t have the cards to fight against multiple do-nothing fatties. I decided to try switching to justice for Vanquish, Avigraft, and Harsh Rule. I quickly realized that Harsh Rule was not what this deck wanted as Harsh Rule is a reactive card and this is a proactive deck. I decided to try out Svetya instead. This new Ixtun deck was able to get me 6 wins deep into rank 2 but after a swift defeat at the hands of a powerful Silver 1 player I was launched back to rank 3. Something wasn’t quite right. I saw my friend and teammate Almost was playing some FPS West-Wind Herald control on stream and I realized something. My 500+ games of West-Wind Herald control during the Into Shadows meta were about to pay off! Iceberg Scattershot West-Wind Herald combo did not need Shadow! It didn’t need Mirror Image anymore with Howling Peak! It also didn’t need Iceberg Scattershot in the maindeck anymore because of Ixtun Merchant! I tweaked my FJP deck with my new realizations and I was able to go 30-6 to make the leap from rank 3 to rank 1. Now that we’ve established how I got to rank 1, let’s go over my card choices. Howling Peak: Howling Peak is the second best card in the game and the reason that this deck is able to function. The reason why Howling Peak is so good is as it can be used both proactively and reactively, and makes an impact on almost any board state. Howling Peak is a threat, removal, and card advantage. If your opponent has a 5 health or less unit without quickdraw, Howling Peak will come down and deal with it. If there is nothing that you need to kill you can just Mirror Image a Jennev Merchant and threaten their life total with 3 attack aegis units. If you need power, or have nothing to copy or kill ,you can Kaleb’s Favor, which is always an extra card you can use with merchants and Strategize. Finally, if you have completed the agenda you get a Kaleb, Reborn. Kaleb is an incredibly powerful card in this deck as he is a threat that will kill your opponent while also allowing you to get rid of a hand filled with power, unnecessary removal spells and fate units, and replace it with a random hand from your deck plus 1 extra card, meaning that Kaleb is always card advantage. In addition to all of these things, Howling Peak also gives every unit you play +3 health so that they can survive torch and other damage based removal and also block far more effectively. To be honest, Howling Peak is incredibly busted and if your deck isn’t equipped to deal with this card then it is bad. Wisdom of the Elders, Strategize, Treasure Trove: These are your card draw spells. Wisdom of the Elders is the most powerful one as it is a 2 for 1 without having to jump through any hoops. Wisdom of the Elders is the best card you can have in your opening hand, the best card you can play on turn 3 and is always a card you are happy to draw. Strategize is a 2 for 1 in conjunction with your fate units, extra power or a used Bore. Strategize can also be used early on in the game to make sure that you hit all of your power so that you can play turn 6 Howling Peak. Treasure Trove is a card from Xo of the Endless Hoard’s fate and ultimate ability. The card allows you to draw a card for 2 power. Treasure Trove’s draw ability allows you to cycle through your deck and make sure that you can hit your power on time. The bonus dragon that you get is extremely powerful as it transforms Treasure Trove from a 2 power draw 1 into a 0 power draw 1 plus a 2 power draw 1. This makes it similar in value to Wisdom of the Elders, since you can get value from the dragon in multiple ways. You can bottom it with strategize, you can market it away with merchants, or if you are in a commanding position you can even play it and attack - but that is not as common. Ixtun Merchant, Jennev Merchant: These are the glue that holds everything together. 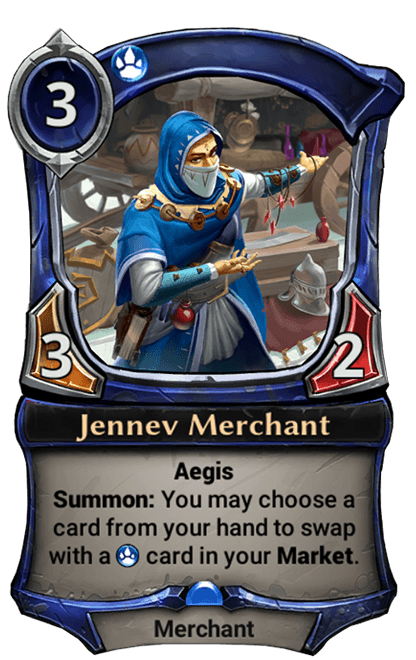 Jennev Merchant is the best card in the game. You can use merchants in conjunction with fate units or Bore to gain card advantage. They can grab power or Howling Peak to guarantee turn 6 Howling Peak. They can grab Burn Them All so you can remove a pesky unit, remove a pesky site, remove a pesky 5 life, or even do all 3 with amplify. Jennev Merchant can grab West-Wind Herald to develop a value threat that forces opponent to remove it, and Ixtun Merchant can grab an Iceberg Scattershot to present an insurmountable board position in conjunction with West-Wind Herald (more on the combo later). In addition to tutoring for whatever you need, both merchants also serve a very important function in this deck: they can attack and block! The primary win condition of this deck is to play Howling Peak and generate enough of an advantage that you are able to kill your opponent with an onslaught of aegis units. Ixtun Merchant isn’t great at this since it dies to a singular removal spell, but it still helps Jennev Merchant and West-Wind Herald apply pressure. Jotun Hurler, Xo of the Endless Hoard: These are the fate units I’ve been mentioning repeatedly. Get rid of them with merchants and Strategize. Xo can be pretty strong himself when played because when he attacks he basically wins the game, but he costs 7 power and dies to a singular removal spell so be careful as playing him could lose you a lot of tempo - which could eventually cost you the game. Torch, Vanquish, Avigraft, Hailstorm, Snowball, Bore: This is your removal package. Torch, Hailstorm and Snowball are your anti aggro cards. You can also use them to deal with pesky aegis on a unit or on opponents face. Permafrost is excluded as it is very bad against the card Howling Peak. Avigraft and Vanquish are your anti-fatty package. You can use Avigraft against a grenadin created by Assembly Line and Grenadin Drone or the sentinels created by Moment of Creation. Remember, you can’t use Avigraft on flyers, so if you expect flyers from your opponent save your Vanquish for them and use Avigraft on ground units. Also you can’t use Avigraft if they have face aegis. In this case use a Kaleb’s Favor, a snowball or Torch to pop their aegis beforehand. Bore is your anti-attachment card. I chose to play Bore in the maindeck because I needed an answer to Avigraft and you can’t play the Avigraft answer in your Market as your merchants are usually the first unit that gets Avigrafted. I was skeptical of the maindeck Bore at first but it’s proved to be incredibly powerful. Because I have 8 merchants and 4 Strategizes, narrow cards like Bore are less harmful when drawn in matchups where they aren’t useful. Also, most decks have targets for Bore so it is not dead as often as you might think. Finally, after you use Bore you can use merchants or Strategize to get rid of the bonus Bore that you draw and gain card advantage. All in all I think Bore is a fantastic inclusion. West-Wind Herald: West-Wind Herald is a value unit that just so happens to create an insurmountable boardstate when you have an Iceberg Scattershot as well. West-Wind Herald can be played on turn 5 and followed up with turn 6 Howling Peak to play Mirror Image on it. You can then attack with West-Wind Herald, trigger infiltrate, and play Mirror Image on West-Wind Herald again. The new West-Wind Heralds will still have infiltrate and will be able to replay a Mirror Image, a card draw spell, or a removal spell after hitting the opponent. You can also play West-Wind Herald on turn 5 when you have a Wisdom of the Elders in the void. It is an extremely valuable play to use West-Wind Herald to play another removal spell or card draw spell. Don’t be afraid to run West-Wind Herald out on turn 5 as it will usually take 2 removal spells to kill so you are almost always getting value. This deck is more of a proactive control deck rather than a combo deck, so play it as such. West-Wind Herald is a unique card in that while it is part of a combo, it also is incredibly effective on its own. Just attacking with Herald and playing Mirror Image every turn is quite powerful. Iceberg Scattershot: Iceberg Scattershot is a combo card. He has almost no value on any boardstate unless combined with West-Wind Herald. Now, let me explain the combo: If you have a Mirror Image in the void and are able to trigger infiltrate of West-Wind Herald while Iceberg Scattershot is on the board, you are then able to make copies of West-Wind Herald until your board is full. Each time you play Mirror Image onto your West-Wind Herald you will create a new herald, which will immediately deal 1 damage when it comes into play thanks to Iceberg Scattershot. This 1 damage will trigger the infiltrate on the new herald, allowing you to once again cast Mirror Image from your void on your herald. This process can be repeated until your board is full, netting you a ton of 2/2 fliers with aegis as well as doming your opponent for almost half their life total. Once your board is full you get to play one extra spell from your void, usually Wisdom of the Elders or a removal spell. Now let’s talk about different ways to trigger the combo. The most common way to trigger combo in this deck is to get to 9 power and just play Iceberg Scattershot and West-Wind Herald in the same turn. Iceberg Scattershot will trigger the infiltrate on your West-Wind Herald and the combo will start. Another way to combo is to have a West-Wind Herald on the board, play Scattershot, then attack with West-Wind Herald and play Mirror Image. Finally, if you have 10 power and a West-Wind Herald in play that can’t attack through opposing flyers you can play an Iceberg Scattershot and then play a Howling Peak and Mirror Image your West-Wind Herald. Powerbase: I chose to play 29 power with a banner in the market because this deck is prone to flooding thanks to all the card draw. I am playing Seek Power over Ixtun Cargo because all you want to do in this deck is get 6 power and play Howling Peak, and Cargo sometimes screws you. Crests are very powerful for getting you to your 6th power or getting rid of excess power later in the game. Cobalt Waystone gives you face aegis to protect against burn, Avigraft, Sabotage effects, and many other more niche cards. I have 3 Fire Sigils so that I have enough sigils to get with Kaleb’s Favor. I have 2 Primal Sigils and 2 Justice Sigils so that Seek Power can always grab a second Primal or Justice influence. The 2 copies of Seat of Order are because I wanted 2 more Justice/Primal power and it is better than Hooru Banner. I like the West-Wind Herald version of the deck over the Molot & Nakova version because it makes my threats far cheaper (5 instead of 8) so I can play them earlier in the game. I also like how it allows me to comfortably play 2 less power since I only need to get to 6 and not 8. Lastly, it allows us to comfortably play 4 copies of Cobalt Waystone (which is incredibly powerful) without placing undue stress on the powerbase. Mulligan Phase: Redrawing in this deck is fairly simple. You are looking for Wisdom of the Elders, Strategize, or Treasure Trove, as well as a Merchant. I don’t like keeping a hand without card draw as it will be incredibly tough to hit Howling Peak on 6. Most initial hands without those 3 things are redraws. The second redraw almost never happens unless your hand is incredibly clunky with nothing to do in the first 3 turns. How to play: This deck is surprisingly simple to play. Your main goal is to play Howling Peak. This means you should draw cards and fetch power with merchants so that Howling Peak can come down ASAP. A usual play pattern is: turn 2 Torch something, turn 3 Wisdom, turn 4 Strategize, turn 5 merchant, turn 6 Howling Peak. On your quest to play Peak you can draw cards and remove threats along the way. You are going to want to draw before playing merchants so that you can know what you want to get rid of and what you want to fetch from your Market. Once Peak is online it is time to beat down. This deck will win by reducing the opponent’s life total to 0. ATTACK!!!!! Don’t sit back and twiddle your thumbs and wait to combo, put pressure on your opponent. Turn your Jennev Merchants into threats. Make sure to protect your Howling Peak, but if you can afford it then ATTACK! A + SPACE. GET IN THERE!!!! When your opponent’s life total is pressured they are forced to deal with your merchants, which means that they have to use up precious removal spells on your 3 drops when they could otherwise play a threat or save removal for your combo pieces. This deck is a proactive control deck. Play proactively and your win-rate will increase. Two Jennev Merchants are a huge threat, your opponent can’t just take 6 damage a turn. If you take one thing away from this article please take away that you should attack. Besides attacking just try to get as much value as you can out of your cards without falling too far behind on tempo. Also, when in doubt just play Peak. Also, and this is especially important, draw before playing your Crests. There are many reasons to do this, but here are a few: drawing first gives you more information about what you should do with your scouts, may allow you to draw an undepleted power, and means that your scout will be able to gain more value. The information advantage that you gain from drawing first is huge over the course of a long game and will increase your win percentage. So unless you need a removal spell THIS TURN always draw first! You can loop Xo or hurler in and out of your market to gain extra fate triggers and card advantage. Don’t be afraid to use Avigraft on merchants. Unless you are worried about fatties, getting rid of all your opponent’s merchants can cripple them. You can use Snowballs to attack sites so if you are worried about sites just stockpile your Snowballs. Burn Them All’s amplify is very powerful with West-Wind Herald’s infiltrate, as you can amplify even though you spent 0 power. You can play Howling Peak while you have a Howling Peak in play, so if you really need to use Gun Down don’t be afraid to overwrite a Howling Peak even if it hasn’t completed its agenda yet. Try to Strategize your Fire Sigils to the bottom so that future Howling Peaks have targets. Keep track of your Fire Sigils and try to play them last. Your influence requirements are PPJJFF(F) order of importance goes PPFJJFF keep that in mind. Howling Peak will usually fetch your third Fire influence for Xo. If you know that you are going to get a specific power with Seek Power then cast Seek before playing a Crest. Otherwise, Crest first to see if you bottom a sigil and search for a power that isn’t the one you bottomed. Iceberg Scattershot can pop face aegis so if you need to Avigraft something that is another option. Well, that’s it for this amazing deck-tech by MrNoTimeMan!. All joking aside, remember that no deck is ever complete - including this one - so if any of you have any ideas about how to improve this deck then TRY THEM. It never hurts to try. The brewers that you respect have many brews that failed and weren’t powerful enough. The difference between good brewers and bad brewers is that good brewers are willing to fail. No idea is too outlandish. The path to success is paved with failure. I hope you enjoy my deck, and I will see you at the top of the ladder.